If there’s one thing I love about fall, it’s pumpkin. Pumpkin everything. I make lots of pumpkin recipes and one of my favorites is this Whipped Pumpkin Spread. As much as I love pumpkin recipes, I especially love ones that aren’t complicated or take forever to make. That’s why this Whipped Pumpkin Spread ranks high up on my lost of favorites. I love it because it’s incredibly easy to make and it’s freakin’ delicious. I am one of those people who snacks throughout the day and this spread is made for people like me. I spread it on my bagel in the morning, and biscuits or fresh rolls throughout the day. 1. Allow the butter to soften up until it’s about room temperature. 2. In a large mixing bowl, whip together the milk and butter with an electric mixer on medium speed. Beat for one minute or until mixture is creamy and smooth. 3. Add in the canned pumpkin and beat for one minute. 4. Next add in the powdered sugar, nutmeg, allspice, cinnamon and vanilla. Beat until all the ingredients are mixed thoroughly. 5. Transfer the whipped spread into an airtight container. You can store your whipped pumpkin spread in the fridge for up to 10 days. This spread is perfect to serve with hot biscuits, bread or bagels! If you love pumpkin, this spread is seriously delicious. If you’re in the mood for a quick pumpkin recipe, try some of this Whipped Pumpkin Spread. It’s quick, easy, really delicious and will surely satisfy your pumpkin craving. Plus, it’s great to bring to parties, too. Everyone will love it and you for bringing it. That sounds so good! I don’t think I’ve ever used a spread like this before. It looks perfect for all kinds of snacky goodness. Om nom nom nom. You know. I just have to wonder if I could put this in between cake layers. Because I think that would be epic. I would never have thought of making pumpkin spread, This looks so yummy I can’t wait to make it to spread on my bagels in the morning. I think a whipped spread is a great idea. It can go with so many different things. And hurrah that it’s pumpkin! This looks absolutely delicious! I love all of the pumpkin everything this time of the year as well. I will have to try this recipe out. It’s certainly the time of year for all things pumpkin! I’d like to dip gingersnaps in your pumpkin spread. Yum! I love how simple it is to make. I’m wondering to myself that I think that might be tasty on a toasted english muffin. Yes please! I’ll be making this since I love my pumpkin stuff. I’ll just grab some bagels and go to town. Like the idea of this spread. Do do you use it on biscuits, rolls and different crackers only? I don’t eat pumpkin very often, but when I do I really enjoy it! Love the idea of a whipped pumpkin spread, it must make everything taste so much better. I feel like I should put this out a party and see what all people put it on. I’m sure the combinations will surprise me! So this looks amazing! Someone mentioned eating gingersnaps with this and I can’t imagine a better treat for the fall. You have no idea how excited I am to read this. I love pumpkin and I try to do almost everything with pumpkins during the season. I cannot wait to try this one. I just love everything pumpkin. This looks seriously delicious and would be perfect on a muffin. I love this idea of making a pumpkin spread. you can literally add it to just about anything and even serve it with some cookies or something if you have unexpected guest. I love the idea of making this whipped pumpkin spread, looks delicious! Best season for it too, thanks for the recipe. I agree, it is the perfect time for this whipped pumpkin spread! Pumpkins are one of my favorite things about fall. Now I would never would have thought of making a pumpkin spread, this sounds like it would be really nice and you could use it on so many different things. I have to try this. It does look like a yummy spread. I’d love to have them with crackers! Thanks for the recipe. Love this. “Pumpkin Season” is totally the best. And this is the first time I ‘ve seen a recipe for pumpkin butter. Will definitely give this a try. Wow, this looks absolutely amazing! I also like the fact that it’s got no nuts in it so my oldest can actually eat it, we always have the hardest time finding snacks for her! Definitely going to make this! I love pumpkin!! I would love to try this and eat it all! May have to share with my three year old though.. lol. This sounds delicious. I bet it would be the perfect fall themed addition to a bagel. Or on graham crackers. I love pumpkin everything. I will have to get the ingredients I need to make this Whipped Pumpkin Spread. I am sure it will be a big hit. This sounds amazing! I’d love to make my own pumpkin spread. That would be awesome and I’m sure the hubs would love it as well. This sounds so delicious! What an awesome recipe idea. I am a huge pumpkin fanatic too! This looks so delicious. I definitely could snack on this throughout the day. I will have to make a batch! I’m not the pumpkin girl, but every year I see so many people who get excited about pumpkin everything. This is my sign that fall has arrived. I bet this would be great on bagels or english muffins. I love fall… so many great flavors. What a great fall recipe! My husband and daughter would just love this! Pumpkin everything for me too! It’s hard to understand why some don’t like it!! Holy goodness, this looks good. I love whipped things because the texture just makes it that much nicer. I just love the idea of this! So good on bagels, but cupcakes, toast, scones, I could go on and on! Now that is looking really good. I’m definitely in the mood for some pumpkin flavored treats and this would be perfect with some biscuits. My favorite part of fall is pumpkin flavors and recipes. This looks like something I must try. It looks so delicious. Pumpkin is my favorite flavor! I love fall mainly because of all the yummy things I get to eat. This spread sounds so perfect to gobble all day. We’re all a huge fan of the pumpkin this season and I’d love to make this for my boys, especially! I’m sure they’ll be very excited to give this a try! Fall is my favorite season! And I can’t wait to enjoy all these Fall flavors! This looks delicious and like something I may have had before. It would be so good with Nilla Waifers. Interesting recipe! 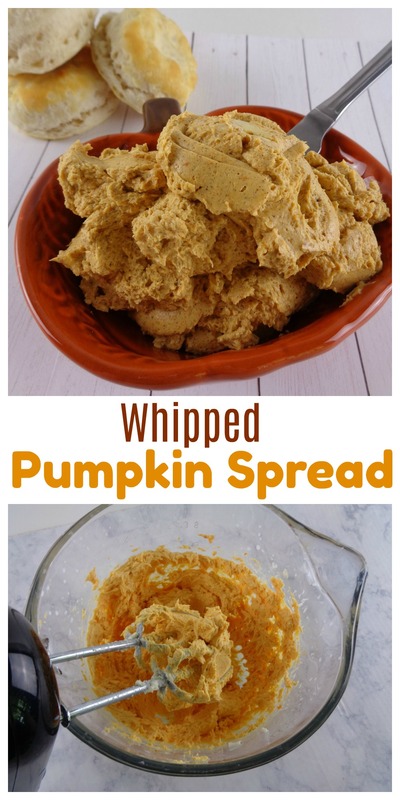 I have not tried making pumpkin spread, but just the fact that my family loves pumpkin everything,I am sure this whipped pumpkin spread would be a winner in the house. Nothing like pumpkin to make you feel more excited about the season! I think this is something that I’ll enjoy! Thanks for the recipe! Holy smokes this looks super easy and delish!!! My husband will cut the grass without me asking if I whipped this up. Thanks for sharing. This pumpkin spread recipe sounds so delicious. I would love to make this one day. This woud be delicious with apples or graham crackers. I had a friend make something similar to this and it was delicious. Excited to try it your way! a pumpkin spice spread?? Wow people who are pumkin spice lover will really love this! Oooh, that looks so yummy, and perfect for biscuits, too! I might have to add this to my list of pumpkin things to try! What goes better with a warm biscuit from the oven, then yummy pumpkin spread! This is a great recipe and super easy to make. I can’t wait to try! Pass me a piece of bread of any kind or heck just a spoon! This is right up my alley! So easy too! As much as I love pumpkin, I’d eat this right out of the bowl. It’s a good thing the kids would fight me for it snowman use on some of our favorite snacks. Bet it’s good on a bagel with cream cheese. It is absolutely so delicious! And the pumpkin is so easy to fine. It is also so fresh and very healthy! The pumpkin recipes just get better and better this season! I love how this one is more savory rather than sweet like most recipes. This looks so easy to make and this pumpkin recipe is perfect for Fall. Pumpkin recipes are increasing at the moment and lots of them are yummy like this one. I’d love to make this someday, will keep this in mind. This looks incredible for fall! Homemade biscuits and this spread need to find their way to my weekend! This pumpkin spread looks incredible. I kind of want to make it all for myself, but i think it would make a great addition for game day or for the upcoming holiday season. This whipped spread looks so good!!! I wish I could eat it! Maybe I will have to try making it with dairy free products!